The author’s previously given method of representation of space-time relationships in restricted relativity, by means of oblique coordinates, is briefly reviewed (J.O. 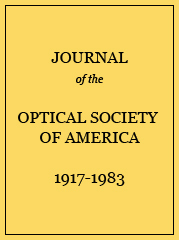 S. A. and R. S. I., 13, p. 155; 1926). The theory is then applied to the following problem: Two observers, S and S′, are moving at a relative velocity q. The S′ observer has in his system a set of pointers distributed parallel to q, and oscillating in synchronism and in phase with one another. It is required to describe the motion as seen by the observer S. By drawing two sine waves in the Lorentzian plane, it is shown graphically that for the S observer the pointers do not swing in synchronism, but form a traveling wave whose velocity of propagation, u, is connected with q by the familiar relationship uq=c2, where c is the velocity of light. Introducing the so-called velocity angle, α, determined by the relationship sin α=q/c, various other properties of the traveling wave, as seen by S, are deduced, such as the apparent frequency at a point in space, the apparent amplitude and its velocity of propagation, the Fitzgerald contraction of the oscillating system, and the slowing down of the frequency of oscillation. By assuming a large number of S′ systems whose velocity angles differ from each other by very small amounts, the group velocity of the “super-light” waves is shown to be equal to the velocity q of the original S′ system. Finally, de Broglie’s quantum principle is stated and transformed in terms of the velocity angle α.